Ever since I decided I wanted to cook in a way that minimizes ingredients, cost, and dishes at the same time as maximizing yum-factor and leftover potential, I quickly fell in love with chicken and veggie bakes like this one, which I found originally on one of my favorite blogs, Kath Eats Real Food. 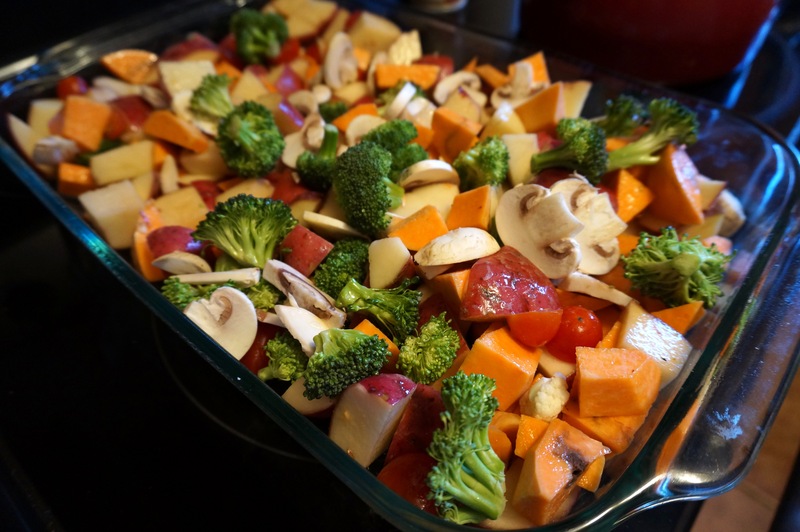 The result was a big casserole-type dish with lots of nutrients, flavor, and a huge amount of wiggle-room to experiment with a ton of flavors and combinations! I think the best part is that you can literally use any combo of ingredients you already have in your fridge or pantry- even frozen ingredients work like a charm! I’ve had a blast trying to come up with the tastiest new creations to experiment with, and my favorite by far has been the Lemon and Dill Chicken and Bean Bake (linked above- you may find that it actually looks quite similar to this recipe!). But since the weather has gotten colder, I decided a smokier flavor might be the best choice for my next chicken bake. 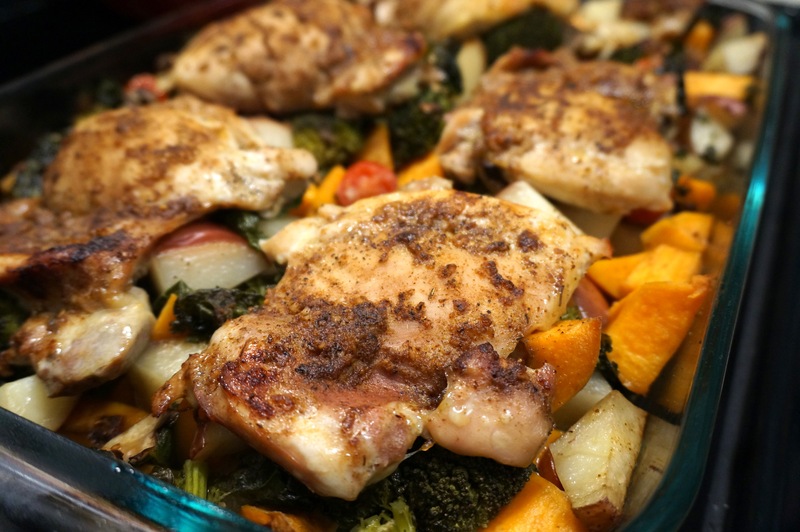 I settled on this honey-chipotle-glazed chicken thigh bake, served over a combination of roasted red and sweet potatoes and mixed with kale, tomatoes, mushrooms, broccoli, and cauliflower. As expected, the juices from the chicken thighs drip down and do their magic, cooking the veggies in a flavorful, meaty “sauce” so that you don’t even need to add many spices at all to the veggies in order to get max flavor! The glaze on this chicken also is the perfect stickiness… next time I might even decide to make some slits in the chicken to allow it to seep down into the nooks and crannies and add an extra punch of honey-chipotle BAM to your bake. Yum! 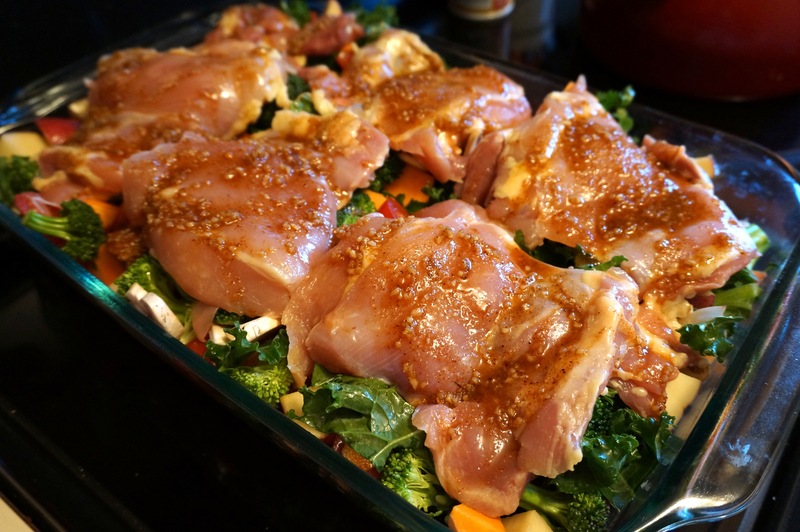 Try this simple recipe for baked chicken thighs with a delicious honey-chipotle glaze! Just toss some potatoes and veggies into a casserole dish and layer the glazed chicken on top. You’ll have a tasty, healthy casserole and leftovers for the whole week! Spray bottom of a large casserole dish with cooking spray. In a large bowl, toss all potatoes with olive oil and a little onion or garlic powder. Spread evenly in bottom of casserole dish. Throw veggies on top of potatoes. Stir gently so that they get coated with a bit of the oil (I sprayed them with a bit more cooking spray, too). In a small bowl, whisk together olive oil, garlic, chili powder, jerk seasoning, honey, vinegar, garlic powder, salt, cumin, and cinnamon (Yes, I know that’s a lot of spices!) until you get a pretty thick paste! Cover lightly with foil. Bake, covered, at 375 deg for 30 minutes. Remove foil and bake uncovered for 10-20 minutes longer, until chicken is no longer pink in center and potatoes are fork-tender. Allow to cool for a least 5 minutes before serving! You could also use chicken breasts in this recipe, but I have to say, even as a white meat lover, the juiciness of the dark meat of these chicken thighs is definitely worth the extra few calories. Plus, it’s cheaper! Layer potatoes and veggies in casserole dish, sprinkling with a touch of garlic powder or onion powder. Don’t you love all the colors? Sometimes I feel like the most intuitive way to cook nutritiously is by color! Layer chicken thighs on top of veggies, drizzle with a bit of oil, and rub down with about a tablespoon or so of the sticky glaze you created. Bake at 375, uncovered for 30 minutes, and uncovered for 10-20 minutes until done.